As many readers of this blog already know, I’ve begun studying the possible shape of the so-called “Stealth Black Hawk” or “Silent Hawk” since the first pictures of the helicopter that had crash landed at Abbottabad, in Pakistan, during the Osama Bin Laden raid (officially named “Operation Neptune’s Spear“), appeared on line. 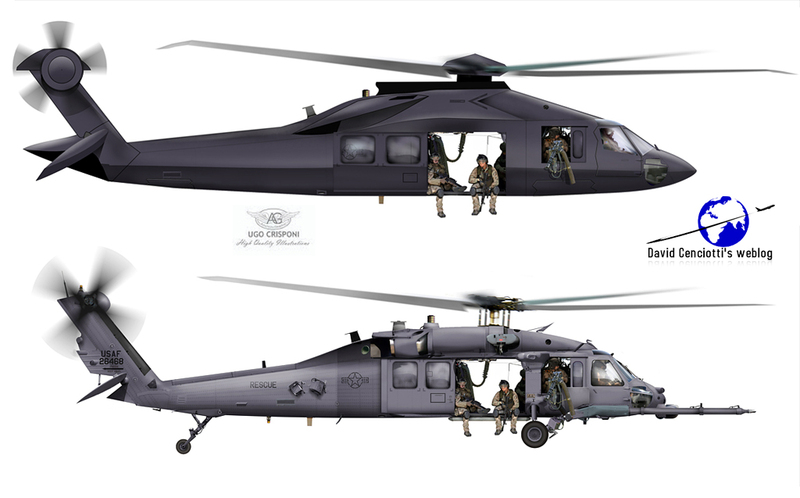 Based on the remains of the tail section, I asked Ugo Crisponi, an artist at AviationGraphic.com, to create a sketch of what the full stealthy chopper would have looked like after applying some upgrades needed to make it, if not radar-evading, at least a bit quieter. With some imagination, “grain of salt”, engine shields, rotor covers, an extra main rotor blade (to slow down the rotor speed making blades quieter), some straight lines and what had survived to the attempt of the U.S. Navy Seals Team 6 to destroy the chopper, we created a realistic shape of the “black”, never seen before, helicopter. Although fairly inaccurate (for obvious reasons…) and resembling an S-76 more than an MH-60 Black Hawk, our Stealth Black Hawk became a worlwide de facto standard: model kits, documentaries, videogames, articles feature the stealthy chopper I conceived with Crisponi as the actual helicopter secretly serving with the 160th SOAR (Special Operations Aviation Regiment). Furthermore, since we named the rendering “MH-X” (because we thought it was an upgraded MH-60) everybody has though that “MH-X” was the official designation of the chopper, even if it is only a fictional designation I used to manage the file versioning with Ugo. Anyway, during the last year, we have continued to receive hints, corrections, official and unofficial comments and we have revised the original rendering to prepare a much more accurate profile of the Stealth Black Hawk that you can find in the image below. The new version of the radar-evading chopper is much more similar to the MH-60: since the stealthy helicopter is an upgraded version of a standard Black Hawk (even according to official sources), it must have the some basic airframe and dimensions. landing gear: the “new” version has a landing gear as a retractable undercarriage would require an extensive redesign of the whole airframe that is quite unlikely for a retrofit work. retractable refueling probe: we put it in the very first version, we removed it in the revised. However, as any other special ops helicopter, the Stealth Black Hawk is probably equipped with a retractable probe needed to perform aerial refueling and to extend the range. chaff and flare dispensers: the helicopter is believed to be equipped with passive countermeasures released through tail section dispensers like those on both sides of the U.S. Navy’s MH-60S “Armed Helo”. As always, if you have any suggestion, send me an email or leave a comment.